B2B Sales Basics: Put the Buzz in Your B2B Sales! 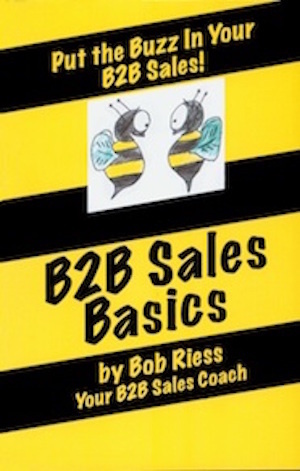 B2B Sales Basics is a guide written for people that are new to business, to business selling, or experienced people that feel the need to step back and review the basics of what it takes to succeed. I understand the intended audience for this guide because I had several people guide me through the ups and downs of getting started in B2B sales. However, I was forced to piece together the advice from several different sources and found that when I tried to “become” a salesperson, I failed miserably. I was about to give up (actually someone might have made the decision for me) when I figured out how to succeed by simply making a few small changes in my approach. Before too long, I was exceeding my quotas and was promoted to the position of sales trainer for my division at NCR. As a sales trainer and performance consultant for GE, I earned trainer certification on several programs. Today, I help my clients enjoy measurable business growth through the application of many of the activities outlined in this workbook. This workbook is just the opposite and is heavy on activities. In fact, I guarantee that when you use the ideas and tips provided in this workbook, you will improve your selling success. As you read this workbook and complete the activities, your ultimate sales success will come from believing in your value, having a strong plan, leveraging the talents of all those that surround you, and making simple changes in your approach to move the sales process forward. Part one is critical to your understanding the most important and basic principles of B2B selling. The remaining chapters are designed so you may pick and chose those to complement the skills you learned in part one. Have fun, complete the activities and enjoy your B2B sales success.